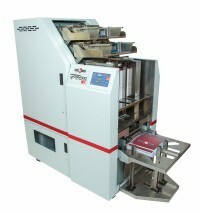 Increase productivity while decreasing labor costs with an Automatic Punching Machine from Rhin-O-Tuff! Featuring the new Tornado AutoPunch, capable of feeding, punching, and collating, Rhin-O-Tuff's industry-leading line of automatic punching equipment can save your operation an average of 40% in process efficiency. That gives you time to focus on more important things and take on even more jobs. Give us a call or send a chat for more information!